Spread some festive joy by choosing to use our wonderfully fun Christmas Hanging Bauble Invitations to invite your nearest and dearest to your gathering. Measuring 150mm by 150mm and printed on 400gsm our invitations can be personalised with up to nine lines of text perfectly positioned next to the beautiful bauble. 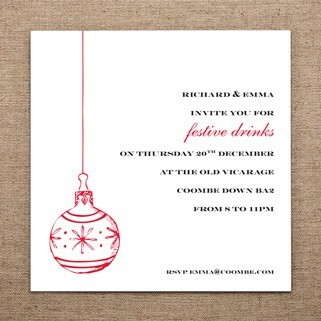 Supplied with matching envelopes and available in quantities from 10 to 200 our Christmas Hanging Bauble Invitations are set to make the right impression.